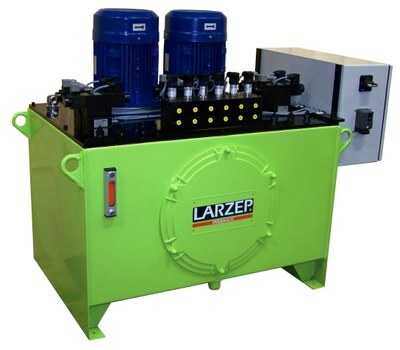 Simultaneous lifting system to power 2, 4, 6 or 8 single or double acting cylinders. Remote pendant to allow the independent control of the lifting or lowering. Simultaneous lifting with less than 2% flow difference between exits. Manual directional control valves (HFM) or push button controlled solenoid valves (HFE versions). Suitable for most of the applications where a uniform lifting is required. Maximum gap around 1mm. HFE solenoid valve powerpacks are supplied with a push button pendant with 5 metre cable. Options: roll bars, heat exchanger, wheel kit and push button remote control, to control all solenoid valves (HFE) or motor control (HFM). Allows the individual or simultaneous movement of each cylinder when lifting or lowering. Advance/retract switch selects the position of the solenoid valves. Individual buttons for each cylinder to operate them independently or at the same time. Simultaneous button moves all the jacks at the same time. To improve the control over the lowering of the cylinders it is highly recommended the use of AZ5255 lowering valves. Can also be supplied with independent remote pendants for each exit. To make the retraction of the single acting spring return cylinders easier, once the movement has finished and the equipment is without load, a switch in the electric box allows the retraction of the cylinders without pushing any button. * Maximum working presure 450 bar.